SALT LAKE CITY (AP) — Gordon Hayward, coming off the best game of his NBA career, is out of the Utah Jazz lineup against Cleveland because of a muscle strain in his left hip flexor. 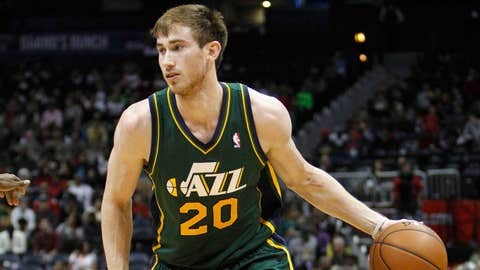 Hayward scored Utah’s final 17 points and had a career-high 37 in a victory over Oklahoma City on Tuesday. But even during his big fourth quarter, he was limping. When asked about it after the game, he shrugged it off and said he’d be fine. When the hip kept bothering him, Hayward had an ultrasound exam that confirmed the strain. He will sit out against the Cavaliers and be a game-time decision Monday against Denver. One of three Jazz players who had appeared in all 37 games this season, Hayward leads the team in scoring (17.1 points per game) and minutes (36.1). Alec Burks, who tops Jazz reserves in scoring at 12.1 points per game, will start in Hayward’s place at guard against the Cavs.